Manufacturer of a wide range of products which include hawaii chappal cutting press, c type chappal cutting power press and chappal cutting press. We are the leading supplier of Hawaii Chappal Cutting Press made available to our clients at competitive prices. 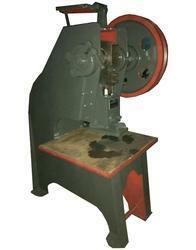 We are the leading supplier of C Type Chappal Cutting Power Press made available to our clients at competitive prices. We are the leading supplier of Chappal Cutting Press made available to our clients at competitive prices.